I'm Melynda and I'm a knitwear designer from Michigan. 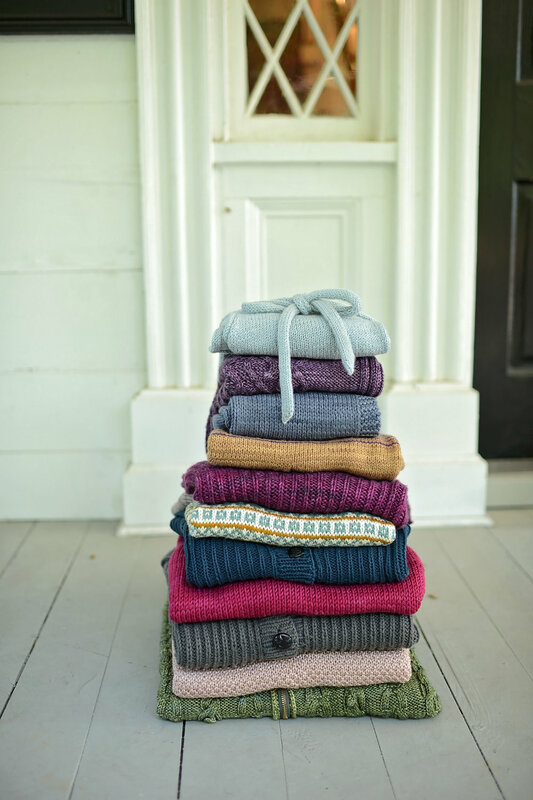 I love working with color and strive for knits with a timeless aesthetic. Here on my blog you'll be able to take a deeper look into the process behind my designs. For special offers and updates, click below to sign up for our newsletter. Did I happen to mention that I have a little collection going at my house? 🙈 🔹 When creating the #leelanausweater , My goal was to design a sweater pattern to work for many shapes and sizes. A simple raglan silhouette with a classic Setesdal stitch pattern is just the thing I can picture everyone in my family wearing. 🔹 That being said, I didn’t *actually* set out to knit one for everyone in my family; but now that there are five, I guess we need a sixth? Elise is the only one without one at this point. I’m feeling a little inspired by @kyriemead ‘s spring-y rest knit color scheme 🤔 🔹 And for everyone else waiting to knit their own: tomorrow!!! Hi, all 👋. It’s been a while since I’ve gotten in front of the camera, so I figured it was time for an introduction. No better time than when I have a new sweater, right?! 🔸 I’m Melynda. I live in Michigan with my husband and four kids (Elise, 8; Sam, 6; Clara, 4... and a half 😜; and Benjamin, 16 months). 🔸 I’m a long time creator/crafter and have become an avid knitter in the past 10 years. I love designing handknits, just wish I was a little quicker with the “writing up the pattern” process (I’m working on it, I promise!). 🔸 I worked full time in medical sales for 10 years but have been home as a full time homemaker/mother for the past three. Happy to be home and here for my kids, but it most definitely comes with its own challenges! There seems to always be an ongoing battle between being truly present and not completely losing things that bring me joy (ahem... knitting and crafting. My kids bring me joy, too... just in a different way🤷🏼‍♀️). 🔸 I had every intention to jump in on the #yarnlovechallenge but I’m a bit late to the party 🤷🏼‍♀️. I may still try to get in on a few prompts before the month is up! 🔸 Thanks for being here with me in this world of Instagram. I love how this window encourages, inspires, and broadens my worldview! “Whatever you are, be a good one” 🔸 Wow. What a week this has been. I feel a little shook up, but in the best way possible. There is a huge conversation happening here in the knitting world that is changing my (and I hope many other’s) everyday life/lives. 🔸 This is the key, my friends: how are you living your everyday? I’ve been reading and learning, sitting in the discomfort of change, and contemplating how these new thoughts will impact this world. 🔸 Knitting/making/creating has been a significant part of my life in the past ten years, but it isn’t (even close) to all of it. Which is why I need to remember to take these truths that have been proclaimed in my “Instagram World” this past week and apply them to the life I life as a wife, friend, sister, daughter, aunt, MOTHER. 🔸 And that is what is sticking with me the most- how am I teaching my kids? What message am I sending them in the way I interact with them and others? Am I educating them in kindness? 🔸 These thoughts are still incomplete. If there is one thing I have learned in my 36 years, it’s that you are never done growing. Never done changing. It’s never too late to ask for forgiveness. A huge thank you to all who have been sharing their stories- your labor is appreciated and heard. 🔸 *This quote here is attributed to Abraham Lincoln, but upon research I have learned that this may be false. This past weekend I packed up my woolens and headed out with knitter friends on a pilgrimage to Rhinebeck, NY for the New York Sheep and Wool Festival. Friend Annie Rowden and I both went the same direction with our Rhinebeck sweaters- grown up versions of our favorite children's sweaters. And wouldn't you know, we're not even the first ones to embrace this concept. Designer Kate Oates has built an entire collection around this idea; and better yet, is releasing book of 10 adult garments inspired by her well- loved children's patterns. You may be familiar with Kate Oates by her handle "Tot Toppers". Kate is a pillar in the world of children's knits, and I'm so happy to see her sharing her talent and aesthetic more and more with us big people, too! Grown is currently available as an e-book, or as a special pre-order bundle which includes the Grown e-book and your choice of a single Tot Toppers original children's pattern (deliverable upon purchase), along with the print version of Grown and a custom Retromantic Fripperies wooden treat (shipping in January). Want a chance to win and e-book copy of this gorgeous, new collection? Just hop on over to Ravelry, pick your favorite knit from the book and give it a "like" or add it to your queue. Then, leave a comment below, making sure you include a way for me to contact you if you are the winner. Giveaway ends Sunday, October 23, 2016 at 11:59 PM EST, winner will be announced Monday. Have fun showing this amazing designer some love!